To develop your own portable job security, you need a master plan. If you are like most people in transition, right now you are thinking about your next job. That's important and it needs to be done. However, you find the best jobs not when you are thinking about them one at a time but when you are thinking about future jobs in a sequence. If each job were a pearl on a necklace, what does the next link look like? The question you want to answer is this: How does my next job set me up for where I want to go after that? Thinking about your future and where you want to be heading in your career, even if it's just two jobs away in the same company, puts you in control of your job destiny. If you are interested in staying in your current company, talk to your boss about how you look forward to developing yourself in your work. What does he/she predict will be the areas of greatest needs in the next two years? (Have some of your own ideas that may help shape the thinking.) They may have plans that would surprise you, and you'll demonstrate that you're a motivated employee. If you are looking to change companies or industries, you'll want your next move to set you up for your longer term goals. Do the skills and experience or contacts you will make in this job head you in the direction you have in mind for the future? When you do not have a plan, you are reactive. Being reactive is like being a pinball-you do not have control. A pinball career doesn't give you time to build industry knowledge and professional relationships. So you need to take control of the choices about where you work and what you do. List at least three jobs that you find interesting and would consider for two jobs from now. Sources of inspiration: the organizational chart of your current company, interesting sounding jobs your friends have, titles and higher-level job job postings, or job titles that you run across in business publications. Why do these sound interesting? Learn the kinds of skills this work requires. If they aren't listed in the job description, ask people who might know. Figure out what you can do in your current or next job that would serve as a springboard for the job after that. You want your next job to help build the management and technical skills, the connections, and industry knowledge that will set you up for your subsequent job. Use the requirements for your second job from now as a test for whether you need to begin shifting some of the content of your current job or, if you're in transition, with the job you are considering for your future. 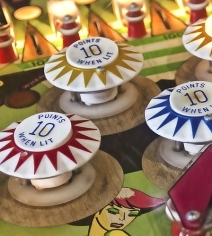 You'll turn from having a pinball career that bounces off of whatever it hits into a pinball wizard.